Philly cheesesteak sandwiches from The American Cheesesteak Co. on Davie Street on October 26, 2011. 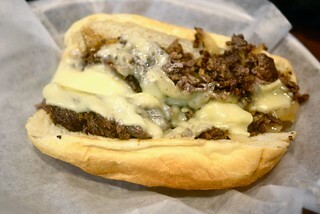 I just had to try the new Philly cheesesteak joint on Davie. The manager spotted us quickly with his thick east coast accent, asking if we were bloggers, and ribbing us for taking photos. 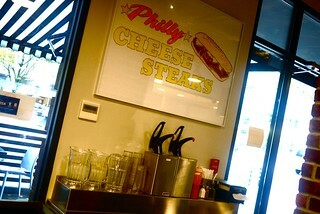 The place looks cool and we were overwhelmed by the simple yet diverse menu of cheesesteak options. FYI, the two prices side-by-side are for small (six inch) and large (nine inch). 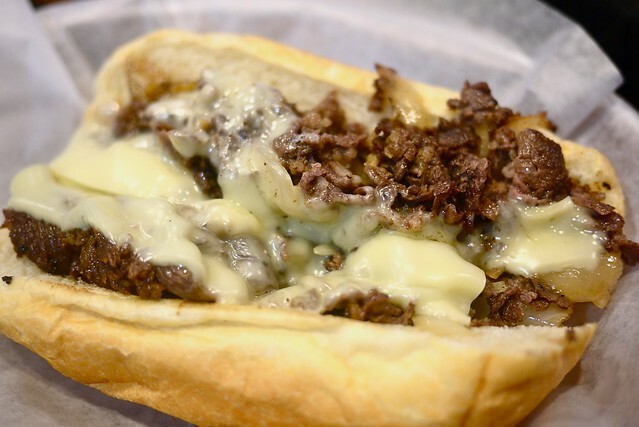 We all got the small regular, basic "The Philly" sandwich with onions and American cheese. Evidently, Cheez Whiz is the authentic choice straight out of Philadelphia. The prime rib was so hot and juicy, it seared through the other side of my bun. 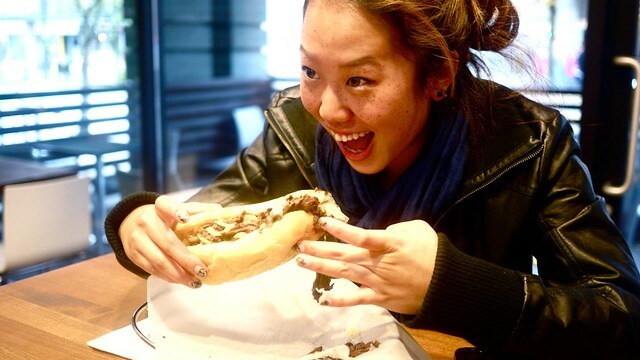 As you can see, Queenie enjoyed scarfing down her Philly cheesesteak. They were good and generously full of shaved prime rib. Surprisingly, I found them not too, too filling. 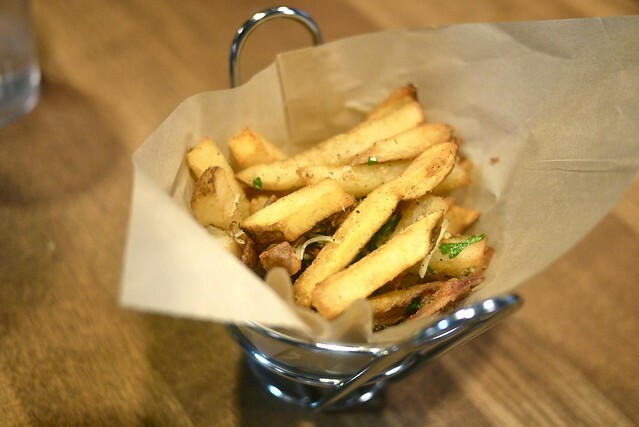 The fresh, hand-cut garlic fries were also pretty scrumptious. The owner prided himself on everything on the menu made as you order it from fresh, handmade ingredients. 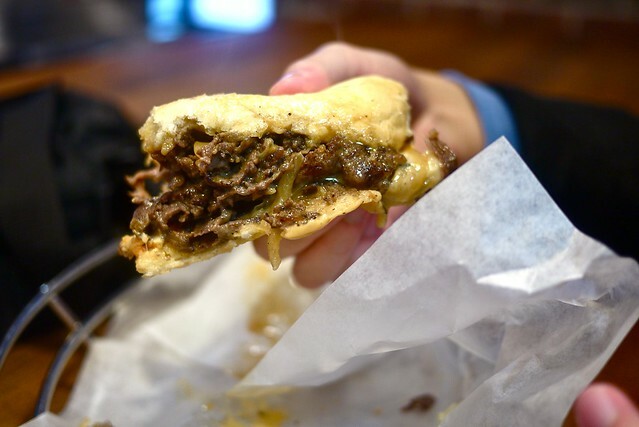 It's hard to say as I've never had an "authentic" Philly cheesesteak before, but they sure were tasty. I look forward to coming back and trying the specialty sandwiches including "The Cowboy" with fried onions, spicy BBQ sauce, bacon mayo, and cheddar.